If a skater manages to dress for 91.2 percent of the games on his schedule over a ten-year period, you could call him durable. If that same player does it for seven different teams in the NHL, you could say he has a skill set in demand. Remember that when thinking of Daniel Winnik as a “fourth liner.” Winnik’s 2016-2017 season, his first full season with the Caps after arriving at the trading deadline in 2016, was among his best in his ten-year career. He set a personal best of 12 goals, had his fifth career season with at least 25 points, had his second-best plus-minus (plus-15), had his second-highest number of even-strength goals (10), tied a personal best of two shorthanded goals (one of 12 players to record more than one shorthanded goal for the Caps in a season since 2005-2006), and posted his more efficient shooting percentage of his career (14.6 percent). Winnik’s production, though modest, was consistent across his ten-game splits. He scored in a range of two to four points in each, save for his last split (12 games) in which he recorded five points. He had at least one goal in seven of his eight splits; he was a “minus” player only once in eight splits. There was also a sense of timeliness to Winnik’s scoring. He was one of ten Caps with three or more game-winning goals (all of which came on home ice), he and Jay Beagle accounting for six game-winning goals from the fourth line. It was part of a broader profile of success when he was contributing offensively, the Caps posting a 15-3-3 record when he recorded at least one point. Winnik was not the player on the road that he was at home, and vice versa. 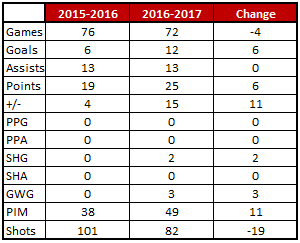 The game splits were about even (37 at home, 35 on the road), but the numbers he posted had distinct differences. He was a scorer on his own at home (9-4-13) but more of a helper on the road (3-9-12). Part of that was efficiency; he was a 20.0 percent shooter at home but just 8.1 percent on the road. He was plus-14 at home, but just plus-1 on the road. He had only eight penalty minutes at home but 41 on the road (including all three fighting majors). Fearless’ Take… Winnik’s ice time was another indicator of success, again perhaps a reflection of the team’s ability to roll all forward lines. The Caps were 31-2-0 in games in which Winnik skated at least 13 minutes. They were just 4-7-3 in games in which he skated less than 11 minutes. And, as a product of his consistency, the higher time logged came with higher shot totals and the success that accompanied it. Washington was 13-3-3 in games in which Winnik recorded at least two shots on goal. Cheerless’ Take… Quality of competition mattered with Winnik’s numbers, which might not be a surprise. He was 8-4-12, plus-10, in 33 games against teams that did not reach the postseason. On the other hand, he was 4-9-13, plus-5, in 39 games against teams that made the playoffs, 2-3-5, plus-1, in 24 games against Eastern Conference playoff qualifiers. 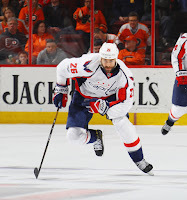 Odd Winnik Fact… Daniel Winnik set a personal best in goals scored despite averaging the lowest amount of ice time of his career (12:55 per game). After dropping the season opener in Pittsburgh to the Penguins in a Gimmick, the Caps opened the home portion of their season against the Islanders, a team with playoff ambitions, having reached the postseason in each of the previous two seasons. The Caps scored first by dominating possession in the Islander end. Tom Wilson curled out of the left wing corner and left the puck for Jay Beagle trailing him. Beagle sent a pass out to John Carlson at the right point, and Carlson wristed a shot that Winnik redirected past goalie Thomas Greiss to make it 1-0, 11:58 into the period. The Islanders tied it two minutes later, and the game remained 1-1 into the second period. Mid-way through the period, Karl Alzner flipped the puck out of the defensive zone where Winnik chased it down. Winnik chipped the puck toward the middle of the ice, causing defenseman Travis Hamonic to get his feet crossed and sending him to the ice. Winnik had a clear path to the Islander net where he faked Greiss to his knees and slipped a forehand past his right pad for what would be the game-winning goal in the Caps’ 2-1 win. The Caps started the season with a modest two-game home winning streak. It did not reach three. Oh, it started well enough with the Caps getting out to a 2-0 lead before the game was 15 minutes old. The Rangers scored four unanswered goals, though, and the Caps had their first home loss of the season. For Winnik, “impactful” would not be an adjective to describe his performance. No points, one shot attempt (missed), a giveaway, and one lost faceoff in nine minutes of play, only three shifts in the third period of the 4-2 loss. It would be a harbinger of things to come for Winnik. He did not record a point in four games against the Rangers for the season and recorded just one shot on goal in 47 minutes of total ice time. Daniel Winnik’s postseason had something of a chicken and egg quality to it. Was his ice time reduced because of poor play, or did his play suffer because of low ice time? In the first three games against Toronto in the opening round, he averaged almost 15 minutes per game and had five shots on goal, but no points. The Caps lost two of those games in overtime. After that, Winnik logged more than ten minutes only three times in ten games, all of them in wins, two of them in overtime. It is worth noting that he had seven games with fewer than ten minutes in the playoffs and only two such games in the regular season. Only once in those last ten games did Winnik record more than one shot on goal – two shots in a 6-2 loss to the Penguins in Game 2 of the second round. He recorded no shots in five of those ten games. All in all, it was an unfortunate postseason for Winnik, who did not record a point in 13 games. He has now gone 32 straight postseason games without a point and has never scored a goal in any of his 58 postseason appearances. As much as for any Capital, 2016-2017 was two different seasons for Daniel Winnik. The regular season portion of the campaign was what one would have wanted from a fourth line forward. He was a sturdy penalty killer (second among forwards in shorthanded ice time per game), and he chipped in points as a part of what might have been the best fourth line in the league. The postseason was another matter entirely. It started frustratingly and got worse. By the end he was planted on the bench, not getting on the ice in the last 11 minutes of the Caps’ 2-0 Game 7 loss to the Penguins in the second round, the team desperate for an offensive spark that never came. Winnik, like too many of his teammates, just didn’t or couldn’t do what needed to be done, even within his role, in the postseason. It was another case of a fine regular season lost in the disappointment of spring.